In this episode of New Solo, host Adriana Linares stops by the shared offices of Barbara Leach and Conti Moore. Together they discuss the cost savings, benefits, and logistics of splitting office resources. Through mutual trust, compromise, and similar views on work-life balance, these lawyers are achieving the strengths of partnership without losing the privilege of being the boss. Tune in to hear how they did it and why you should consider this practice model. Barbara Leach is a solo practitioner in central Florida who, after launching her career with a large national law firm, sought a closer connection to her community and greater interaction with clients. She took the leap to establish her own firm in 2011. Since then, the firm has continuously grown, and Barbara finds herself right where she hoped to be: face-to-face with her clients and practicing in bankruptcy, family law, foreclosure, and litigation. Conti Moore is the founder of small firm Conti Moore, PLLC where she practices in family law, criminal defense, personal injury, and business law. She has been recognized by the National Bar Association and Impact as one of the Nation’s Best Advocates: 40 Lawyers Under 40 and was presented with their Excellence in Service Award for her unyielding commitment to community service. Conti has bar admission in Florida, Nevada, and the U.S. District Court of Nevada. Special thanks to our sponsor, Solo Practice University. Advertiser: So you’re an attorney, and you’ve decided to go out on your own. Now what? You need a plan and you’re not alone. Join expert host, Adriana Linares, and her distinguished guests on New Solo. Tune in to the lively conversation, as they share insights and information about how to successfully run your law firm, here on Legal Talk Network. Adriana Linares: Hello and welcome to New Solo on Legal Talk Network. This is Adriana Linares and today I’m in Orlando. I’m a legal technology trainer and consultant and get to help lawyers use technology better. On our last episode, we talked to attorney Conti Moore from Orlando about her marketing efforts with TV commercials. That was a great episode, I hope you listened to it as well. I’m back in Conti’s office because Conti has a really neat arrangement with a dear friend of hers and a colleague and another solo practitioner named Barbara Leach. So we’re going to talk to them about office resources, and office space, and how they help each other out through networking efforts and referrals and all kinds of good stuff. But before I do that, I want to make sure to thank our sponsor, Solo Practice University. Solo Practice University is a great place for you as a solo, whether you’re an actual solo, a new solo, or thinking about going solo to get out there and learn about some of the best practices that will help you make your law firm successful. So here I am. Hello, Barbara. Adriana Linares: It’s nice to have you here in Conti’s office – oh, wait, I don’t know, am I in Conti’s office or Barbara’s office? Conti Moore: You’re in our conference room. Adriana Linares: I love it. So, Conti Moore, introduce yourself. We got to chat with you last time in our last episode, but tell our listeners in case they weren’t’ there or haven’t listened to it yet – and they should – a little bit about you and your practice. Conti Moore: My name is Conti Moore and I have a practice here in Orlando, Florida, and I handle family law and criminal defense. Barbara Leach: And I’m Barbara Leach. I have a practice here and I do predominantly family law, consumer bankruptcy, and some civil litigation. Adriana Linares: So the two of you are solos, sort of, because Conti, you have an associate, so you’re like a solo plus one. Barbara, do you have an associate? Barbara Leach: I work with contract attorneys, so I’m a solo plus .25. Adriana Linares: Oh, interesting, it’s a whole ‘nother episode. And you have your trusty office mascot that I’m so lucky to be petting right now and remaining calm and sweet. The chihuahua? Barbara Leach: Yes, the chihuahua. She’s our number one source here. Adriana Linares: She’s your greeter, she’s your copier, she runs errands, she brings coffee. So I’m excited to talk to you both because, well Barbara, you’re a dear friend of mine and Conti and I are becoming close friends because I keep stopping by your office to say hi to you. And you and I were chatting one day; I walked in and the sign outside says, “Conti Moore Law,” the sign outside says, Barbara Leach Law.” And I was really curious about how the two of you came to share office space together and you and I chatted about it. It was very interesting and I thought lawyers should hear about this. So tell me a little bit about your backgrounds, how you all met, and sort of how you came to this arrangement. Barbara Leach: Well, today, actually, November 11 is my 4th anniversary of my law firm launch party. Barbara Leach: Thanks, guys! I opened my office four years ago. But prior to that, Conti and I had actually gone to law school together. We had known each other but we had different paths. I was working for a large firm in Orlando, decided it wasn’t what I wanted to do, that I wanted to be out on my own. And I had had my firm for probably about six or eight months by the time Conti and I started deciding that we were both in a position where we were growing large enough where we didn’t want to just rent offices out of other law firms. Instead, we thought it was time for us to hang out legitimate concrete shingles, and we just started talking about maybe we should share space. Adriana Linares: And Conti, what were you doing at the time? Barbara was at a big firm but I think you had a small firm, maybe? Conti Moore: Well, I actually started out in Las Vegas at a large firm for Vegas at first, and then I moved out here and started a firm with three other friends from law school. So at that particular time, Barbara was actually of counsel or sharing an office with us at that office, so I decided to leave the firm and then Barbara and I decided to share a space together. Adriana Linares: And the two of you have a beautiful space in prime location in central Florida. Was this the first space you actually got or had you moved around a little bit? Barbara Leach: My other firm is right next door. Conti Moore: Oh, so you’re not very far! Conti Moore: Yeah, I knew that this was good, we like the landlord. It’s a good location, it’s two blocks from the courthouse so we wanted to stay here. Adriana Linares: Wow. That’s great. So the two of you decided we’re going to go out and do this together but we’re still going to be solos. So you didn’t decide to join forces as one law firm. Why did you decide to stay separate technically? Conti Moore: Well for me, I wanted to have my own firm, I didn’t want to have to consult anybody else about decisions. Adriana Linares: You wanted to be the boss. Conti Moore: Yeah, so it works out great because she’s her boss, I’m my boss, but we share expenses. So you don’t have to really consult about expenses but that’s really it. So it’s two separate firms but we’re able to share costs and save money and we even share some staff members. Adriana Linares: Okay, tell me a little bit about that. Barbara Leach: Well, since we were a full time law firm but it’s expensive to have somebody answer your phones 48 hours a week, so we have one person who works 20 hours a week for me and then 20 hours a week for Conti, but they’re answering all of our phones whenever we’re open. Adriana Linares: So there are two phone lines and she can tell which is the Conti Moore and which is the Barbara Leach line. Conti Moore: We have VOIP, voice over IP and you can add a tag so that when someone calls in from my line, it has Conti or CM. When they call for Barbara, it has BL, so they know how to answer the phone. Adriana Linares: Oh, that’s good. Adriana Linares: Oh, that’s very good. So you’ve got a shared receptionist and phone line, and then does that person also do taskwork and administrative work as well? Adriana Linares: Is that the one that does 20 and 20 hours? Conti Moore: We have two people who are doing 20 and 20. So for me, I hae a discovery paralegal, and she works 20 hours for me. So on we know that on Mondays, she’s with us in the morning, Tuesday I’m in the afternoon. So it works and they also do tasks, it’s not just answering the phones. They have assignments. Adriana Linares: I got it. So do they ever say to you, “I’ve got to finish this project for Conti, it’s going to be 3 or 4 hours, or, “It will be on Tuesday, I’ll get started on this,” or is it a very specific time schedule? Barbara Leach: It’s a very specific time schedule that they work for us. Sometimes if there is an emergency, that person will swap out and work for me when she’s scheduled to work for Conti. But one of the things that I think is so awesome about how successful our relationship is is that we’re very fluid and sympathetic. We come from big firm backgrounds, we understand that you have to share resources and that some things are just greater priority than others. Conti Moore: And it’s also helpful that the copy release, we get to split that. The postage meter, split that. And with our copier, I’m sure that most copiers have this ability, but we put in client codes. So Barbara could run a report and they could add Barbara’s expenses to client bills and mine as well. I can’t imagine doing it without you. We use a lot of technology, a lot of expenses, and we’re also able to share information and ideas. But one thing that’s important is that we also rent out of one of our offices as well to another attorney, but what we included in our fee agreement was language that states that you acknowledge that you are not represented by any of the other firms within this office and that you are only represented by Conti Moore law or Barbara Leach law. To avoid any confusion, that’s in the fee agreement. Adriana Linares: Oh, that’s very good. So you mentioned the copier lease and you obviously split the rent, the lease and the void system lease and everything else. How do you pay each other? Do you pay some of those? How do you guys actually work that out? Barbara pays some bills and I pay others, and at the end of the year we try to figure out if anyone owes the other person money. But for the most part, we try to say the copier is $250 a month, you’ll take on that; Conti, you’ll pay for the postage, and then we’ll work it out in the end. And we’ve really had no problem. Barbara Leach: Part of that is because we’re big picture people. We don’t get caught up in the minutia of, “Hey, you owe me $3.50 this month.” So it really works for us. I think that if any of your listeners are contemplating such an arrangement, they really need to identify how they are and then have that kind of candid conversation with the person with whom they’re contemplating a shared relationship. Because if somebody’s down in the weeds and the minutia and the other person’s big picture, that may or may not work. Adriana Linares: Well, it helps that the two of you are very close friends. So if there’s an issue, you can probably pretty candidly say to the other person you owe me, or I don’t like this. But you’re right, that’s definitely something. And maybe that’s even harder sometimes among friends that decide. I’m sure you have friends who have had this problem. Barbara Leach: Well, as it relates to close friends, I would say yes, we have become really close. We call each other our work wives. I was in Conti’s wedding when she got married in New Orleans, and it’s been fantastic, but it didn’t start out that way. We actually didn’t know each other that well when we entered into this agreement. The reason that we decided we wanted to share space together is because of two primary reasons that I think everyone needs to consider. Number one, we have the same work ethic. So when we shared space at the office next door, we were the ones there who were coming in early in the morning. We recognized that about each other. Number two, we also had a candid conversation in terms of the value we place on intangibles. Even though we’re separate firms, we both dedicate a certain amount of money each year. We host an annual Valentine’s party that we pay for on an annual basis. If someone more was frugal than Conti or shortsighted, they wouldn’t see the value of us investing in that really fun party. Adriana Linares: From talking to Conti in the last interview, I mentioned we talked to her about her commercials, she’s obviously very savvy with marketing and branding. And Barbara, I know that you are as well, I mean you’ve got your whole marketing brand. She’s pink, you’re teal, it’s very separate, but you’re constantly working on that branding, and the Valentine’s party to me is brilliant. It’s a no frills kind of holiday. There’s no political stuff involved, and the fact that both of you could have fun with that, you’re right. Those little things make a big difference. You get along personality wise, your work ethics are the same; your practices are a little bit similar, so is there ever a feeling of competition or is this helping each other out and how do you actually help each other, referring each other’s’ businesses or giving each other help? Conti Moore: I refer a lot of the cases that come in. Barbara charges a consultation fee, I do not. So when I have someone that calls me and I’m like, “Eh, they might waste my time,” send them to Barbara. Adriana Linares: I thought you were just being generous! Conti Moore: But hey, if they’re willing to pay the $100, make the money; go ahead. Adriana Linares: Do you get a referral fee? How does that work? Adriana Linares: This is just all good will between two lawyers sharing resources. That’s good. Conti Moore: But really, we don’t get a lot of walk-in clients. And if we do, they may not be the client that either one of us really wants. Go downtown in Orlando. But there’s not a lot of competition. We work together on some cases. Instead of me referring it out, like, “Hey, Barb, I need help with this; are you in?” And then we make sure that the agreement reflects that both firms are representing that particular person. It really works out really well. Adriana Linares: And do you bounce ideas? A lot of times solos get worried that they’ll be lonely or who am I going to walk down the hall and talk to. So that must be a benefit. Conti Moore: Oh, absolutely, hands down. We are always bouncing. Come read this email for me. Does this sound okay? It’s helpful to have someone near you and close to you to help you think through some of these issues. Barbara Leach: This is actually a good point when I said there were two things to discuss. Adriana Linares: Oh, yeah, we didn’t get to your second one, I’m sorry. Adriana Linares: Not on a date? That’s a whole different episode? Barbara Leach: We do that too. Adriana Linares: We could do that one, you and me. Barbara Leach: We should! The idea of what is that person’s approach to working. So Conti and I are both very similar in that we’re a little bit ADHD. And if she comes in my office and interrupts me with a question, then I will jump in whatever she’s working on and needs help with and vice versa. If I have a question, she’s the first one to stop what she’s doing to help me. That’s great because we’re the same. We both have lots of lawyer friends who would stroke out if someone came and tried to talk to them during an unallocated time to do so. Adriana Linares: This was unscheduled. I can not help you, I can not look at your email for you, this is unscheduled! That’s a really important thing to consider. Alright, well before we move on to our next segment, we’re going to take a quick break to hear message from our sponsors. Advertiser: Ready to create and build your own solo or small firm practice? Need a nuts-and-bolts education on the 360 degree experience of starting a business? There is only one online destination dedicated to helping you achieve your goals. Solo Practice University. The only online educational and professional networking community dedicated to lawyers and law students who want to go into practice for themselves. More than 1,000 classes, 58 faculty and mentors. What are you waiting for? Check out SoloPracticeUniversity.com today. 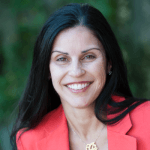 Adriana Linares: Welcome back to New Solo, I’m Adriana Linares and with me today – or I should say I’m in the law offices of Conti Moore and Barbara Leach; two very impressive and amazing lawyers in central Florida. Before we left off, we were kind of jumping around a couple of different topics, how you share employees, resources, copiers, how you two actually have the same work ethic and work well together. I want to go back a bit and talk a little bit more about employees. Let’s start with how do you pay them. Is there one paycheck? Two paychecks? Conti Moore: Two paychecks. So they get paid 20 hours from my payroll and 20 hours from Barbara’s payroll, so we keep that separate. Adriana Linares: What about overtime? Adriana Linares: Got it. And why did you decide to do no overtime? Conti Moore: I mean, we don’t need them to do overtime. We make sure that the tasks can get done within their allotted time. Adriana Linares: Well, the two of you, I’ve been around you for a little bit now. You run very efficient firms. So do you have certain systems in place, procedures? How do you train people when they come in, your employees on how to run those systems. Conti Moore: Barbara gets to take credit for all of this. Tell them what you do. Adriana Linares: She’s an animal. Barbara Leach: I am the queen of the checklist. If you’ve never read, either the Checklist Manifesto or the E-Myth, those are really great books that say you should have checklists. Yes, Adriana. Adriana Linares: Did you do regular E-Myth or the E-Myth for layers? Barbara Leach: I actually did both because I’m kind of nerdy. I’m nerdy. But the idea is whatever task you have, somebody should be able to walk in off the street and accomplish that task by following a procedure or a checklist. The chihuahua has a checklist. Adriana Linares: And she’s performing it perfectly right now if it’s take a nap while we discuss business. Checkbox. How about bonuses? Do you do bonuses? Conti Moore: Yes. So we discuss for our joint employees what we’re going to give them for bonuses, so we kind of talk about that and we discuss that. Barbara Leach: But even for the ones who aren’t joint, like my paralegal or your associate and the paralegal, we discuss when we’re going to give it and do it at the same time so that there’s no ill will, no one feeling like they’re being left hanging and the like. Adriana Linares: So you have a couple of your own employees and then there are the shared resources. So obviously, you must interview together and then if you have to let someone go, that’s something you do together. Is that right? Barbara Leach: Yes. Fortunately, it hasn’t happened where we had to let a joint person go. Adriana Linares: Oh, boy, if our listeners could just see Conti’s face right now. Conti tends to disagree. Conti Moore: Yes, I disagree with you. We’ve had a couple of interns that were joint. Barbara Leach: Those were interns, those weren’t employees. Barbara Leach: No. We have had this come up a few times and in that circumstance, we both have kind of been heading down the path. It’s just one person has wanted to make it happen quicker than the other, and actually, it’s usually me. Conti Moore: No, that’s true, and Barbara’s not allowed to hire anybody at all. Can I tell a story? Let me give you an example of why Barbara is not allowed to hire anyone like herself. She hired someone named Passion. Adriana Linares: Because Barbara believes she was going to have passion for her job? Conti Moore: Her name was Passion. Adriana Linares: I wonder what she did in the evenings. Barbara Leach: We are not telling this story! Conti Moore: I don’t know. I don’t either but what can you do with the name Passion? You can’t work here. So anyway, Barbara, again, is not allowed to hire anyone. But it’s good to be able to say are you crazy because she always pulls me back when I’m about to do something crazy, I pull her back. But it’s good to have a partnership without a real partnership because we’re not talking about money or whatever else. We’re talking about expenses and who to hire to answer our phones and who not to hire. Adriana Linares: I love that. Barbara Leach: I think the biggest argument we ever had was what color to paint the accent wall when we built out our conference room. Conti Moore: Yes, and your thing in the back that I hate. Adriana Linares: Well, being in your conference room, however you all decide on this colors, they’re very nice, so good job. Maybe it took a mediator. Maybe you had to call Liz McCall in here to do some meditating for you two between your paint colors. So I have another question for you going back to the employees. So I bet – and Conti, I don’t know you quite as well, but I know Babs – you must have employee meetings on a regular basis. Barbara? Barbara Leach: Yes, we do. Actually, it’s funny that you say that because we just instituted a couple of months ago a monthly staff appreciation celebration lunch. Conti Moore: And informational meetings. Barbara Leach: Well, I was going to turn that over to you. Adriana Linares: So the two offices do it together because you have some shared but some individual but everybody’s kind of like family here. So tell me a little bit about it. Conti Moore: Well, actually, today you would be very proud of us. We went over technology items. We went over how to use contacts, Outlook, how to create a template email in Outlook. It was a very good meeting but it was a good time for us to get together and celebrate birthdays and anniversaries and then also talk about how to be more efficient, how to use technology. Because it’s so hard to go over those things throughout the month, but it’s easier to do it, sit down, have lunch, and talk about how to use certain technologies. Adriana Linares: And I’m sure your employees really appreciate that. So let me go back just a section because you did mention technology and I didn’t ask you this earlier. Barbara, you use what practice management system? Adriana Linares: And then Conti, what do you use? Adriana Linares: So does the receptionist have two computers? Does she have to login and logout? Do you have both? Clio obviously is web based. Do you have them use two separate browsers? How do you manage popping between the two firms? Conti Moore: Basically, Barbara and I have agreed to a certain – except for our management systems – the same technology. For Outlook, there’s two inboxes: one for Barbara Leach and one for Conti Moore. For our calendars, they’re shared on that computer for the receptionist, so she’s able to calendar and schedule things for both Barbara and myself. So it works out very well. We have popup drivers for our printer so we can actually put in client codes so we can bill our clients. But for technology, it’s not Barbara’s thing as much as it is mine, so she kind of lets me take the lead on that and figure out all the technology. But she takes the lead on checklists and keeping everything organized. So for us it’s really like what she’s not great at, I’m good at. What I’m not good at, she’s great at. Adriana Linares: It sounds like a great match. And to Barbara’s credit, she did spend two full days at the Clio Club conference learning about technology and practice management. Conti Moore: And practice management, and she convinced me to change our phones to Vonage. So we’re going to be saving at least half. It’s like $200 or $300 a month we’re going to save by switching to Vonage for our voice over IP. Barbara Leach: I got that from Clio. Adriana Linares: That’s why those conferences are so useful sometimes because you can really get some great ideas. So speaking of phones and the new Vonage whenever it comes in, how do you choose phone coverage? Who opens the office? Who closes the office? Is there a schedule that Barbara made? Conti Moore: Pretty much. We have a handbook for our receptionist that details everything from how to water the plants or how to walk the orchids in the office. No, seriously. Barbara is insane when it comes to these. Let me tell you a story about this. In our handbook for our receptionist, Barbara thought it was important to be so detailed as to explain how much water you should pour into the orchids. So Barbara mists the orchids. Barbara is in Super Lawyer Magazine and she only had one copy of this magazine and it’s right next to the orchid. One of our receptionists, I guess she didn’t read the directions thoroughly, and she started to really pour water into the orchid and then it spilled out onto her only magazine, the only one that she purchased, that one magazine. So the magazine is just flooded. Barbara comes out of her office and her face is just red. She shuts the door and she says, “The directions said to mist the orchid! Mist the orchid!” And sure enough, she pulled up the handbook and it said to mist the orchid, and she did not mist the orchid and she ruined Barbara’s magazine, the one Super Lawyer copy. Not so super! So yeah, checklist. Checklist, and perhaps signing off on the checklist that it has been received and acknowledged. Well, ladies, this has been one of the funnest and definitely most insightful interviews I’ve done in a really long time and I can’t thank you enough because I know how busy you both are. Tell our listeners – let’s start with Barbara – how they could learn more about you, find out what you’re doing. You have a lot of extra curricular activities that you do, you’re very involved with the Florida Bar, I know you’re working on a book. So tell our listeners how they could keep an eye on you or learn more about your practice. Barbara Leach: Well, I’m Barbara Leach, my website is BleachLaw.com. We like to say we clean up your legal messes. And thanks to Big AL, Adriana Linares, I’m now on Twitter, @PinkLadyLawyer. Adriana Linares: Ooh, pink lady lawyer, because that is your color and Conti’s is teal. Barbara Leach: And [email protected]. And I’m also all over Facebook, so come be my friend. Adriana Linares: Excellent. Just tell us a little bit about yourself, Conti. Conti Moore: Alright, if you want to find me, you can find me on my website, ContiMooreLaw.com. I’m on Twitter, @AttorneyConti. You can give me a call as well at (407) 831-0203. Adriana Linares: Well, I just want to thank you all one last time for everything you’ve taught us and told us and the good laughs we’ve had today. Thank you so much. And for all our listeners who want to learn more about what you’ve heard today, make sure you visit New Solo on the Legal Talk Network and if you like what you’re hearing, make sure you give us a good rating on iTunes. My producer keeps reminding me to ask for that, so I’m going to say it out loud. Listen to the podcast, go out on iTunes and give us a nice rating. You can also follow us on Twitter and Facebook. So that brings us to the end of our show and I’m Adriana Linares thanking you so much for listening. Hope to see you next time for another great episode. And remember, you’re not alone. You’re a new solo. Advertiser: Thanks for listening to New Solo with host Adriana Linares. Tune in again to learn more about how to successfully run your new practice. Solo, here, on Legal Talk Network. The views expressed by the participants of this program are their own, and do not represent the views of nor are they endorsed by, Legal Talk Network, its officers, directors, employees, agents, representatives, shareholders, and subsidiaries. None of the content should be considered legal advice. As always, consult a lawyer. New Solo covers a diverse range of topics including transitioning from law firm to solo practice, law practice management, and more. Renee and Phil Stackhouse discuss their individual careers and delve into how they manage their personal lives as a couple and as parents. Paige Greenlee and Brittany Maxey-Fisher talk about their career experiences. Neil Squillante of TechnoLawyer talks about TL NewsWire’s top 25 products awards. Matt Spiegel, co-founder and CEO of Lawmatics, talks about the software solutions they offer lawyers for streamlining the processes of customer relationship management.